An extra strong version of this box is available, created because of public demand at the 2015 "Musicmania" Olympia Record Fair! We have sourced a special grade of high impact plastic for these boxes, which are only available in the natural material colour of near white. These boxes are much stronger than all other models and are perfect for uses where the contents require maximum protection from damage e.g. 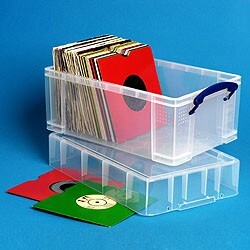 record storage, courier boxes for parcel deliveries or airfreight, etc. The colour choice is listed as "white strong". 08 Sep 2017 by Jock T.
These are great for stacking 45rpm records in and keeping them safe. Bought this for my vinyl collection, would recommend. I have used Really Useful Boxes for several years, mainly for storing and transporting items to exhibitions, demonstrations etc. The robust construction, lid clips and ability to stack make them ideal. The clear boxes are transparent enough for the contents to be visible which is convenient if you have as many as I do and can't be bothered to label them. Not only are these 9XL boxes great for a hundred 7 inch vinyl records, and stack on top of each other, but they also stack on top of the 19XL boxes which take 50x LPs/12".